As I posted recently, we had an issue at Tesco where the till froze/crashed after authorising a contactless card. This created a slight deadlock where we could see, and show, that the card clearly authorised - it shows on the banking app as such, but Tesco insist it has "not gone through". The result is we left our details and left without paying (again). The simple view as a layman is easy - you can see that the "money has been taken". You have paid, end of story, why would you pay again? Having worked with cards before, and being reasonably up to speed on how such things work (often more so that people I speak in banks, sadly), I can see what has happened. The way card payments work is there is an immediate "authorisation", and later (usually of the order or two working days) the payment is settled, which matches up with the authorisation. Once upon a time card statements arrived on paper every month, and so this delay did not really matter. With on-line banking it is a lot more obvious. The bank will "earmark" the funds when they see the authorisation, making the balance seem lower, waiting for the settlement. These days banks are letting you see the "pending transactions". Monzo go further and make it look like the transaction has happened, only in small print does it say "pending". However, this settlement only works if the till / back-end system - has the transaction details. If the authorisation happens and then the details are lost, then they cannot settle the transaction. In this case, what happened? It is now three days later, the groceries at the same store (also on a Monzo card) have settled, i.e. no longer showing as "pending" on the app. The £20 for petrol still shows as pending. Experience is that this will show as a £20 credit some time next week if not settled, and at this point, after 3 days, it is not likely to be settled. So we owe Tesco £20. I went in this morning, queued at customer services, paid the £20. However, get this, the man in front of me in the queue was in basically the same situation and was there paying £50. 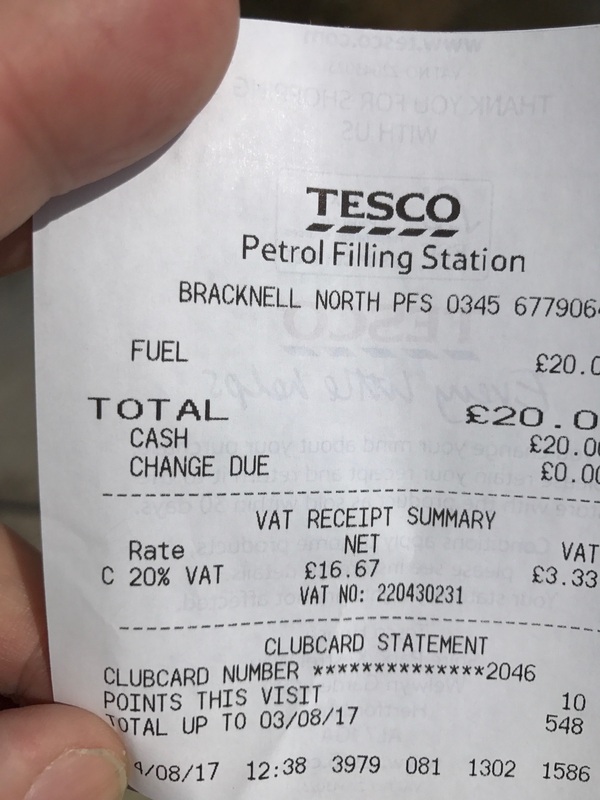 Apparently he paid on some other card, and from what I can gather he even got a receipt, but Tesco contacted him to say it had "not gone through" and can he come in and pay. Is this a huge co-incidence, or a sign that Tesco (at least that Tesco/garage) have a serious issue? One interesting part of the debate is where things stood legally. Had we committed any sort of offence or breach of contract or what? Firstly in terms of crime, an issue some people raised on irc (concerned we would get a visit from the police) - I am pretty confident on this, albeit not a lawyer, that there has to be some intent for there to be theft. It is clear we intended to pay - the fact we have the bank confirming the card was authorised shows we presented a valid payment card with sufficient funds. So any dispute from there on in is pretty much a civil / contract matter. As for contracts - I doubt there is a formal written contract and even if there was one, we would not have seen, read, and agreed it. There is, however, a normal process for making payment which means presenting the card to the contactless terminal, and seeing that it did in fact read and authorise the payment. There is not normally a receipt in many shops. So one can argue that all of the actions normally require for payment were done by us, we did our bit, so not in any way in breach. One person argued that refusing to "try again" showed intent not to pay, well, again, the discussion at the time was that we would be happy to pay if this does not go through, but we won't know that for a few days, will we? So again, clear intent to pay, just not intent to pay twice. It is also likely that trying again would mean £40 is reduced from the balance with £20 coming back a week later, inconveniencing us when we did nothing wrong. I am told that this is not always the case and some POS systems can indicate that this is an attempt to re-authorise, but no idea if Tesco tills can do that or if Monzo cope with that. I think, contractually, the situation created an impasse that could not be resolved without waiting a few days to see if the payment is settled. Tesco could not prove that they would not submit the transaction for payment. We could not prove that they would. All we could prove is we did try to pay, and there is an authorisation, so if Tesco did have the details to settle the payment, or recovered them later, then Tesco could take the money. I therefore think the remedy for we we opted was spot on: waiting and seeing if the payment goes through, and then, if necessary (as we did) paying Tesco what is due at a later date. What annoys me is they took around 25 minutes of hassling my wife for that to happen. I also think that a judge would take a very much "average man in the street" view, which would be "it says on the phone bank app that I paid, so I have every right to assume I have paid". Who knows?! We did not get a receipt, but that is normal for contactless anyway in many places. I do however find it rather interesting if the other person in the queue got a receipt, as he says. I was always under the impression that a receipt is a pretty important contractual document. It confirms receipt of payment. You cannot have people saying later "it did not go through", else that makes the bit of paper totally meaningless. Annoying - I did read it, honest... Not well enough. Just a quick note on the receipt situation. You state that the other person was paying £50. The contactless limit is £30, so his payment must have been via chip and pin, and thus would have generated a receipt, as it's only contactless payments that sometimes don't (AFAIK it's not a requirement to create a receipt for a contactless payment, but as a retailer you can if you want to). Unless it was phone bonking, which doesn't have the limit (because phones have secondary authentication ie. fingerprint they're not subject to it). Apple Pay — a form of contactless — goes higher than £30, although possibly not relevant here. Android pay will also allow above £30 if the card terminal is capable of doing so. You will need to unlock/authorise with Pin/Fingerprint. Interestingly though with android pay being essentially a virtual card I did have a McDonald's terminal in a motorway service station once ask me to insert my card into the chip'n'pin machine. "AFAIK it's not a requirement to create a receipt for a contactless payment"
It is a requirement to create a receipt if the customer asks or if the payment is over £30. The fact they didn't get their money means they didn't even end up knowing which card tried to pay, if they'd know they'd have just issued settlement instructions anyway (see below). If you went with the "it didn't work, try again" solution that still ends up fine in the UK if you're paying attention. Now, the fact is that settlement is completely disconnected from Authorization, the supermarkets can (and Co-op did a while back) issue the same settlement twice, or sixty times, or just make up settlements for card holders who've never so much as visited their store. All legal in some sense, although pretty obviously the latter is fraud as far as the layman is concerned. Authorization is covered with lots of security features like Chip & PIN, cryptographic verifiers, and the PCI DSS rules. But Settlement has no rules, it's basically the Wild West, except that in the UK (and some other European countries) local law says if the issuer can't prove you owed the money they have to unwind the transaction and put things back how they should be, with either the issuer or the retailer eating the costs. So: Make sure you read your credit card bill. Dispute anything you don't understand on the bill, demand to see proof you authorised any unrecognised transaction. Don't make lemonade, make life take the lemons back! Until the lack of security for Settlement starts hurting banks in the wallet, they won't secure it. The typical behaviour of all retailers I've used is to ask you if you'd like a receipt after a contactless transaction has gone through - presumably they are advised to do this by the bank. One exception, self-service train ticket machines, that even with a chip and pin payment don't print a credit card receipt unless you press the button asking for one while your ticket is still printing. I'd add that with Apple Pay you immediately get a push notification (not generated locally) with the merchant name and amount. was the original hiccup due to the Monzo outage about that time? No, seems to be the till itself. The Monzo was fine, and notified the authorisation fine. There does seem to be something weird happening with Monzo, I had a transaction where I used contactless, it went through fine but then a few minutes later I got a notification of a refund. Monzo tells you everything that goes on, so you see these kind of real time shenanigans all the time. It probably happens on all cards but mostly you don't find out until the statement - and banks don't tell you about preauthorisation holds etc. Theft requires intent to PERMANENTLY deprive someone of their property (that's why kids who take cars and joyride in them get charged with 'taking without consent' - since otherwise they simply argue in court that they intended to bring the car back). So I think it's clear in this case that theft has not been committed, though there could be an open question as to whether your wife took the petrol without consent. But I also don't think there's a breach of contract. 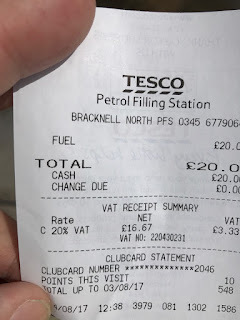 By convention all petrol stations operate in a mode where the goods are supplied (irretrievably so; especially if you dispense super-unleaded into a car already half-full of premium where you can't even argue that it's all fungible and get it back out) before payment is made. That's no different than lots of suppliers (including A&A) who provide goods or services that are not paid for until later. The only thing that happened here is that payment was made later than would normally be the case, due to a failure of the merchant's system. There's no loss, no damage to any party, nothing. You have a contract in any case. It is just implied. The existence of this contract is why it *is* theft to just pick something off the shelves and walk out of the shop without paying: there is an expectation on the part of both parties (you, and the shopkeeper) that these are not gifts but should be paid for. Not all contracts require signatures and pieces of paper! However, it is equally clear that there was an intent to pay, and you did pay: there was just a delay while you waited for settlement so you could see whether your earlier attempt to pay had succeeded, which is also fine. So the fact that there was a contract is not relevant here, since you didn't violate it. Indeed, I did not mean to suggest a contract needed to be on paper, etc. The fact there is no formally agreed process for use of the card machine was my point, making it a bit more wooly - my wife did what convention and practice is to do. I also think the existence of a contract is what makes it clearly not theft in that one can then rely on the 2(1)(a) defence in the Theft Act 1968 that you believe you have a right under law (contract law) to take the petrol given you are doing your side of the contract in agreeing to pay for it (eventually). I would not of paid yet, If the card terminal has failed and needed replacing then the batch of data would be delayed as no day end would of been performed on the original terminal. This usually takes a while to catch up. I think these are all done centrally and not a per card terminal thing like small retailers. I may be wrong. We'll soon find out. And expect us to take their word for it? From a legal perspective the test for dishonesty can be found in R v Ghosh . The test is simple - would a reasonable man consider it dishonest? If a reasonable man considers it *not* dishonest then the matter should be resolved in favour of the accused, i.e. a verdict of not guilty. "In determining whether the prosecution has proved that the defendant was acting dishonestly, a jury must first of all decide whether according to the ordinary standards of reasonable and honest people what was done was dishonest. If it was not dishonest by those standards, that is the end of the matter and the prosecution fails." "If it was dishonest by those standards, then the jury must consider whether the defendant himself must have realised that what he was doing was by those standards dishonest." It's important to remember that taking petrol is *not* theft according to law, it's actually considered making off without payment contrary to s3 of the Act. However the test for dishonesty is still the same. "A person who, knowing that payment on the spot for any goods supplied or service done is required or expected from him, dishonestly makes off without having paid as required or expected and with intent to avoid payment of the amount shall be guilty of an offence." The authority (for it not being theft) is Edwards v Ddin (1976). Therefore in respect of the Theft Act a Judge or Magistrate is permitted to exercise common unlike with some of the more recent pieces of legislation. Bear in mind that requires *both* dishonesty and an intent to avoid payment. > The test is simple - would a reasonable man consider it dishonest? - if so, did the defendant realise that, by those standards, what he was doing was dishonest. Theft Act 1978 for "making off without payment", rather than Theft Act 1968 for "theft". the objective assessment is there to prevent an appellant from asserting that because *he* didn't believe it to dishonest that he should be entitled to an acquittal. The subjective prong is more akin to an evidential test. It is *not* a defence for the appellant to suggest that he was acting honestly by *his own* standards. He ought to apply the standards of reasonable men, i.e. does he believe that the "reasonable man" would have found it dishonest? From 15 years of call I can tell you that it is extremely rare for a court to find otherwise on the second limb if they've found against the appellant on the first. I've only ever seen this go favourably for the appellant when he is mentally defective. Ergo the second prong is probative insofar as the court are concerned. The easiest way to explain it to the layman is that the test is "would a reasonable man consider it dishonest?" Bilking (making off) as it's commonly called can, as you say, be found within the Theft Act 1978. I'm damned if I would have gone back and wasted my time and effort paying a second attempt to get their broken system to work properly. You did everything required of you to render payment. The fact that they failed to do their bit (settle the txn) whether through stupidity, incompetance, ignorance or laziness, is no concern of yours. Honestly: if you had issued a cheque for the fuel - back in the days when this was acceptable - and they failed to deposit the cheque into their bank within six months, would you pop back and offer to write another cheque? Of course not. Everything is 'offer and acceptance'. They offered the fuel. You accepted. You offered the payment. They, for whatever reason, refused it. This is why I settle any dispute by cheque. That way they have to actively deposit my cheque and commit the act of 'acceptance' as 'full and final' as written on the back of the cheque. If I send a bank transfer for settlement then they don't do any specific overt act of 'accepting' my settlement as 'full and final' and can come back later with further demands. Either a contract was formed, or it wasn't. If a contract wasn't formed, then the goods aren't yours and you aren't entitled to take them (and likewise the money isn't Tesco's and they aren't entitled to take it). If a contract was formed, then the goods are yours and you can take them, and you owe Tesco the money for them. Let me first tackle the question of whether the contract was formed or not. The formal process is that at the counter you make an offer to buy the goods. If the cashier accepts the offer, then the contract is formed. It seems to me (though I'm not sure) that this happens before you pay. I'd say that it's an implied term of the contract that you pay (in cash) immediately or arrange to pay (cheque or card) immediately. It doesn't make sense to say that the contract is formed only after you pay, since typically contracts are first agreed and then the parties perform their obligations under those contracts. If a party performed obligations (eg. pay money or supply goods) before the contract is formed, then it wouldn't make sense to form a contract afterwards, since it'd be one-sided and thus there would be no exchange of consideration. So I'm claiming that the contract was formed before you arranged payment, and as part of the contract you agreed to arrange payment, since the contract must exist by the time you perform your obligations under it. It may make sense for Tesco to claim that the contract was made but then voided when you failed to pay, except that I think there's enough evidence in your case that the failure was between Tesco and their merchant bank so the problem wasn't caused by your failure to perform your end of the contract (namely: arrange payment with your card). Clearly you still owe them money under the contract, but it can't be claimed that you failed to perform. Since Tesco can't unilaterally void the contract after it is formed, the contract can't have been made void. So I've established that a contract exists for the sale of goods and was in force at the time of the payment systems failure. Since a contract exists, it follows, then, that you both own the goods and owe Tesco the money. This is what happens as soon as the contract is formed, and I don't think this part is controversial. If you own the goods, in civil law taking them home cannot cause Tesco harm, and so they would have no grounds to make any civil claim against you for doing so. Tesco may end up short of the money though, and that can harm Tesco (both in the short term because they don't have it, and in the long term because they risk never getting it) so let's next consider if you owe them damages in civil law if Tesco fail to get the money. The implied contract term was for you to arrange payment immediately. You appear to have done so, and can confirm that the payment appears to have gone through because your bank claims that the payment was authorised. So clearly you've performed your end of the deal here. That Tesco have a problem on their system acknowledging receipt and perhaps getting the transaction cleared is a problem, but it equally isn't reasonable for you to then pay a second time. I don't think Tesco would be able to prove to the necessary civil standard that your action (leaving without authorising a second payment) is the cause of the harm to them here. Clearly you aren't under any obligation to pay twice. So my conclusion is that under civil law Tesco would not be entitled to any damages against you, so therefore you were quite right to leave. Under criminal law, because you tried to pay, confirmed and demonstrated that your bank claimed the authorisation was made, *and* left your details, I think there's no way (given the criminal standard of proof required) that you were being dishonest, or intended to permanently deprive them of the goods without payment, or intended to avoid payment. I always ask for a paper receipt for card transactions, contactless or otherwise. When my monthly statement comes through the post (still on paper) I go through it and check all the transactions match the paper receipts I have. I consider this much more reliable than any degree of cross checking I could do online or in Apps. The sums involved can be too large to trust computers given how buggy all the software seems to be these days. As far as I understood the contract at point of approved authorisation is between the merchant (Tesco) and the authorisee (Monzo), as Monzo has promised to pay Tesco on your behalf at that point. Any failure to settle said transaction from the authorisation balance is still between Tesco and Monzo. Any failure for Monzo to take this money from you, is between you and Monzo and not you and Tesco. If you can demonstrate that a contract / authorisation has been established between the third parties for the goods, then your direct liability should cease? The card authorisation fulfills your side of the contract with or without a receipt. Any grounds for action would therefore not be in contract law but be in unjust enrichment, since in the end you acquired a benefit at Tesco's expense in what were (before the payment was settled) unjust circumstances. Expected remedy would be the objective market value of the goods (i.e. the advertised price), which you've now paid. A judge would certainly take the 'average man in the street' view. As an aside; if you'd handed over physical cash and they'd lost it, you haven't benefited (and obviously there's no case to answer). In the case of card authorisation it's only because you retain the funds in the event they are reckless (lose the auth code) that they could claim against you later. My mother was tracked down by the police for non-payment at some point last year - she'd filled the tank, then gone in and handed over a bar of chocolate and the credit card, saying 'pump 3', entered her PIN (without checking the amount) and gone away. Of course, the guy on the till had ignored the petrol aspect, charged the 50p bar of chocolate on its own, then called the police about the "non-payment". Have you considered Tesco's PayQwik? Yes, its yet another app you have to download, but you link both your card and clubcard and effectively do both in one scan. I bought a Christmas present (less than £10) online and used PayPal to checkout. Apparently their system didn't claim the payment before their authorisation expired so they were out of pocket. They rang, explained this, then demanded credit card details over the phone to "settle matters to avoid them taking action". They were unable to authenticate themselves to me (couldn't even verify my address) so I refused and told them to send me a PayPal money request amount via email for the amount instead, i.e. stick with the original payment method and give me time to verify that the money was indeed not taken. No letter. Instead they sold the debt (~£10) to a dept chaser!